Abigail Johnson, Fidelity Investments chairman, spoke at a New York tech conference Tuesday. 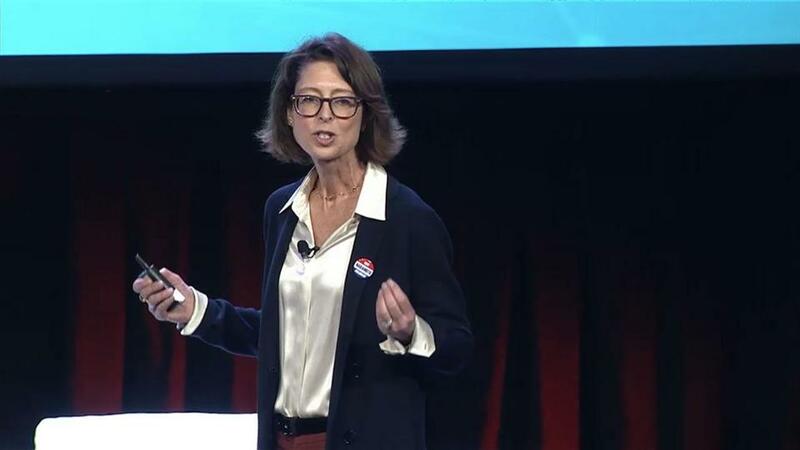 Abigail Johnson, in her first major speaking engagement since becoming chairman of Fidelity Investments, spoke Tuesday in New York at a tech conference — not on mutual funds or retirement plans, but about bitcoin and blockchain technology. Johnson, who has embraced technology in her rise to the top job at Fidelity, went on to say, “I love this stuff,” along with thinking about what the future holds. She was sporting a “Vote Nakamoto President” lapel pin, an inside joke referring to the pseudonym used by the mysterious founders of bitcoin. It turns out Fidelity Labs, the company’s research group, has a team dedicated to working on bitcoin and the technology that makes it work. So-called blockchain technology is about sharing electronic data. It could change the way billions of financial transactions are handled, with uses such as settling securities faster and cheaper, with less human intervention. Fidelity also has allowed customers to contribute bitcoin to their charitable giving accounts, Johnson said, using an intermediary later to convert the currency into dollars. Clients have donated $8 million worth so far, she said to applause at the Consensus 2017 conference. Johnson said the company has heard from customers who want to be able to track their digital currency holdings through Fidelity’s website, where they have records for their other financial accounts. The company tested it with employees, she said, and will soon roll out the capacity to all of its customers. Fidelity also has made venture investments in companies exploring digital currencies, Johnson said in the speech, and has partnered with other firms and university efforts, including the MIT Digital Currency Initiative. “Blockchain technology isn’t just a more efficient way to settle securities. It will fundamentally change market structures, and maybe even the architecture of the Internet itself,” she said. But Johnson also challenged the conference attendees to make the technology better, easier to use, and more practical for people’s lives. Just getting people to understand bitcoin is complex. The currency has recently been trading at record highs and was valued at $2,227 Tuesday at Coinbase, a website where people can buy and sell the digital currency. Under the bitcoin system, there is a finite amount of currency. Its value fluctuates, depending on demand, but it’s not linked to gold or some other physical thing. Fidelity has tested letting employees use bitcoin in the company cafeteria, Johnson said, though fewer than 100 workers have tried it. She recalled the experience of one employee, Alex, whom she called a “bitcoin Viking.” After buying a beverage in the cafeteria using bitcoin, he then tried to return the drink. But the bitcoin network was being spammed that day, Johnson said, and the return process was taking hours. Alex gave up in despair. “It’s like the matrix — I can’t actually use it in real life,’’ Johnson recalled Alex saying.